In early August, Mr. Pirate & I spent some time at Lake Tahoe (on the border between California & Nevada). One of the shops I poked my nose into had interesting bandana squares and I bought two: one of butterflies and one of a moose. The bandanas are about 18-20" and I thought they would make great throw pillows. BUT ... being me, I didn't want to "just" make a pillow out of a bandana; I wanted to put something personal into it. I worked on the butterfly bandana first and thought quite a bit about what kind of border to put around it. 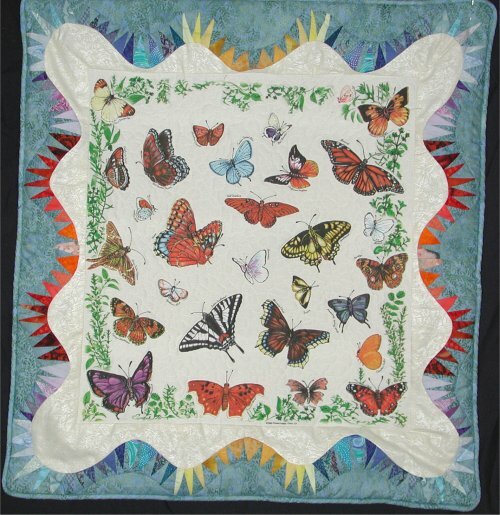 The butterflies on the scarf are quite colorful, so I took the different colors of the butterflies and put them in a spikey, curving border, which came from the FABULOUS book, "Foundation Borders" by Jane Hall and Dixe Haywood. 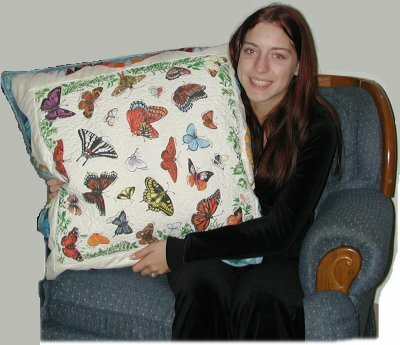 I outline-stitched all the butterflies and then stippled around each of them.